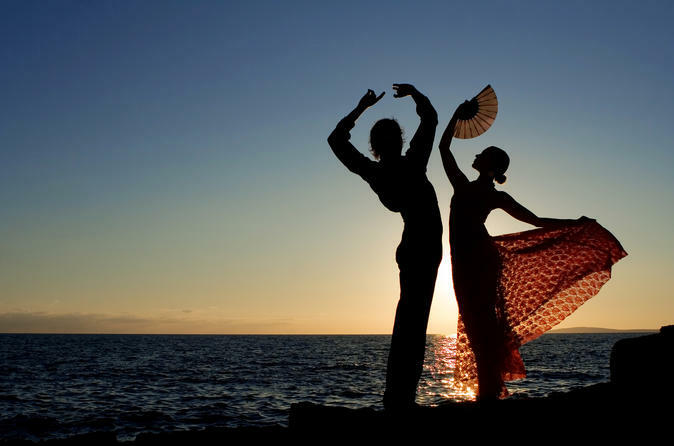 Feel the passion and heat of Spain's traditional dance at the legendary Cafe de Chinitas flamenco show. Be swept up in the rhythm as an internationally renowned flamenco group of artists perform Spain’s national dance, against a background of beautiful Spanish tiles inspired by Granada’s Alhambra. Some of the greatest names in flamenco have sung and danced on stage, and no Spanish trip is complete without experiencing flamenco in Madrid. Watch the show with a drink or choose the dinner option to include a traditional Spanish meal. Founded in 1970, Cafe Chinitas is located in a beautiful and inviting 18th century mansion – a perfect place for those wishing to combine Mediterranean cuisine with the best flamenco in the Spanish capital. Some of flamenco’s most important artistes have performed at Cafe de Chinitas. Tomas de Madrid, La Chunga, always barefoot and spontaneous, the legendary Rosario, Maria Albaicin, Carmen Mora, PastoraImperio, Manuela Vargas, and the "Los Pelaos" family as well as the most outstanding singers dominating a variety of styles, such as Carmen Linares, Tony Maya, Maria Vargas, Enrique Morente, El Lebrijano, and Jose Merce, who started his career in this tablao to become one of the most famous flamenco artistes of the moment.